Are you among those bunch of beauty enthusiasts who immediately add a product without even checking or reading online reviews. To be more precise – more of a makeup collector and strongly believe in your own instincts. 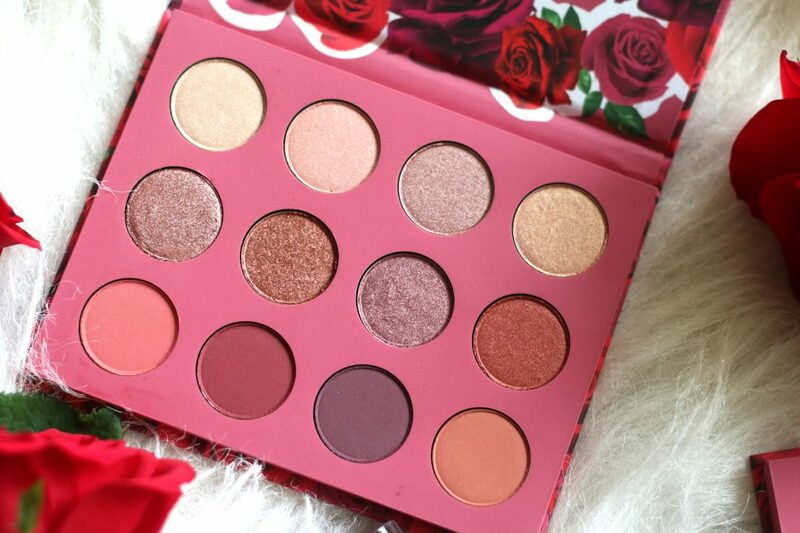 Well, I am Team Swift and I knew this absolutely gorgeous looking super affordable palette has to be mine the moment I saw its preview on @trendmood1. 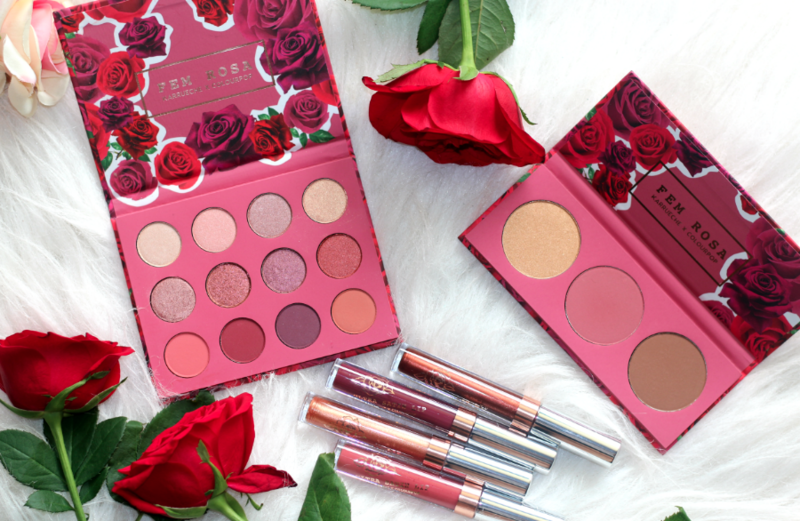 ColourPop SHE palette features 12 highly pigmented shadows that applies evenly and feels ultra-velvety, luxe and silky. This long wearing formula contains a unique combination of softer powders which adheres easily to the eyes, gives a soft focus effect, and blends smoothly and evenly. The shades are well paced on a magnetic cardboard palette. 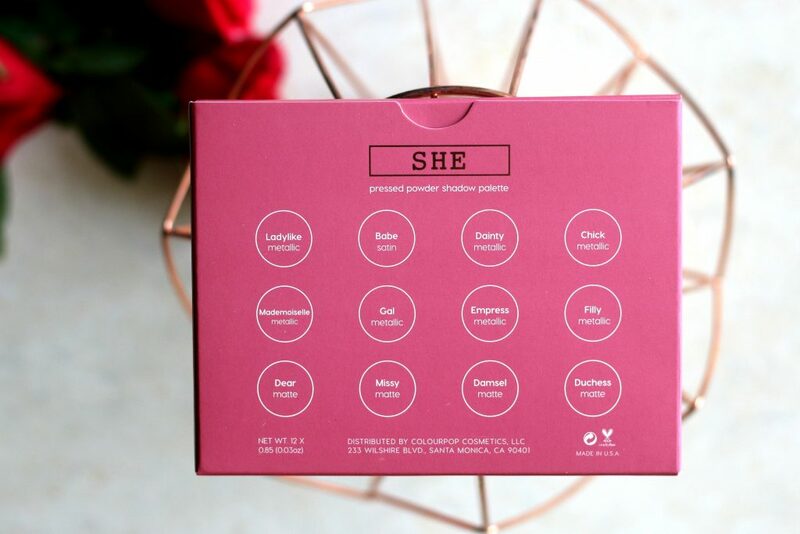 This palette is smaller than your usual eyeshadow palette. 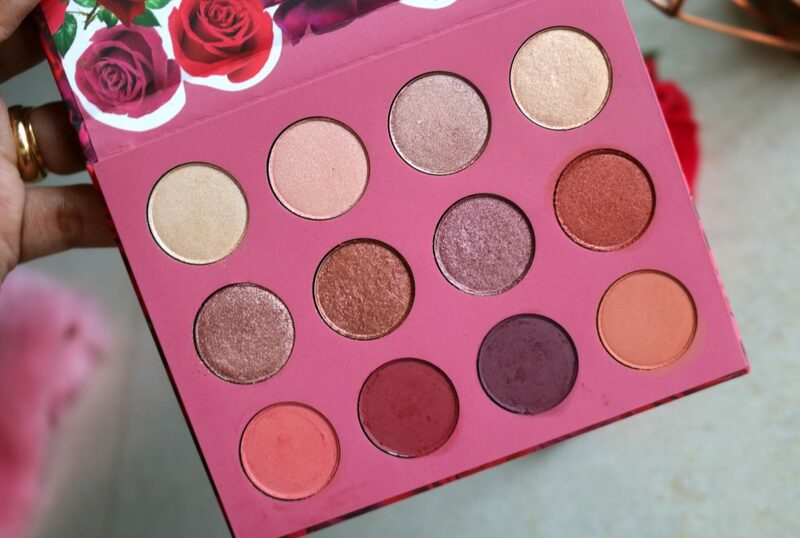 It’s the same size as other Colourpop Palettes. I think this is perfect for traveling. 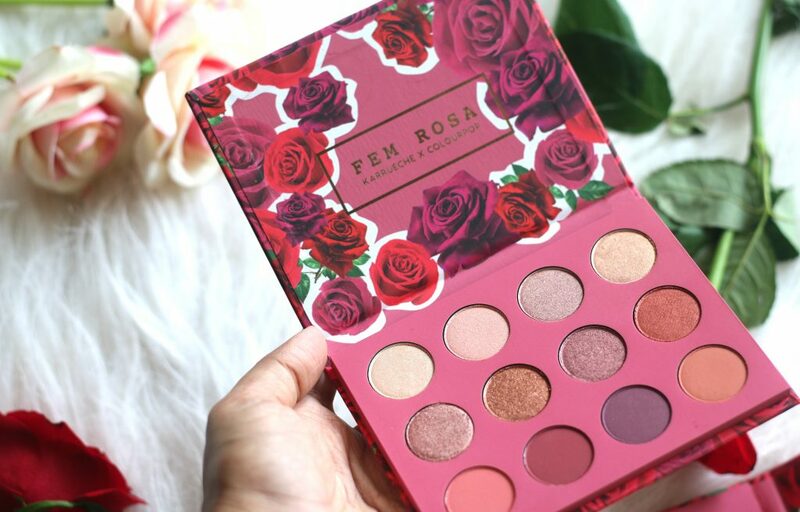 This palette outer packaging cardboard design features the ever romantic rosey tones and details. This palette is a mix of metallic, satin, and matte shades that adds to a total of 12 eyeshadows. Overall, a dream in one palette and that too for just USD $16.00 ; Yes, you read it right. 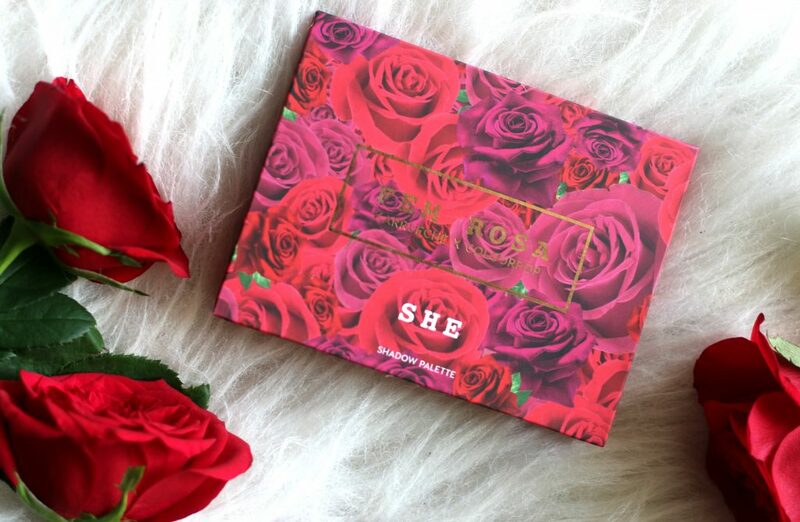 $16.00 only for this awesome palette! LADYLIKE: DIMETHICONE, BORON NITRIDE, LAUROYL LYSINE, MAGNESIUM STEARATE, DIMETHICONOL, PHENOXYETHANOL, TALC, CAPRYLYL GLYCOL, ETHYLHEXYLGLYCERIN, HEXYLENE GLYCOL, TIN OXIDE, BISMUTH OXYCHLORIDE (CI 77163), IRON OXIDES (CI 77491, CI 77492), MICA (CI 77019), TITANIUM DIOXIDE (CI 77891). BABE: BORON NITRIDE, DIMETHICONE, MAGNESIUM STEARATE, CAPRYLIC/CAPRIC TRIGLYCERIDE, LAUROYL LYSINE, TALC, PHENOXYETHANOL, CAPRYLYL GLYCOL, TIN OXIDE, DIMETHICONOL, ETHYLHEXYLGLYCERIN, HEXYLENE GLYCOL, BISMUTH OXYCHLORIDE (CI 77163), CARMINE (CI 75470), MICA (CI 77019), TITANIUM DIOXIDE (CI 77891), YELLOW 5 LAKE (CI 19140). DAINTY: DIMETHICONE, SYNTHETIC FLUORPHLOGOPITE, BORON NITRIDE, LAUROYL LYSINE, MAGNESIUM STEARATE, DIMETHICONOL, PHENOXYETHANOL, TALC, CAPRYLYL GLYCOL, TIN OXIDE, ETHYLHEXYLGLYCERIN, HEXYLENE GLYCOL, BISMUTH OXYCHLORIDE (CI 77163), CARMINE (CI 75470), IRON OXIDES (CI 77491), MICA (CI 77019), TITANIUM DIOXIDE (CI 77891). CHICK: BORON NITRIDE, DIMETHICONE, MAGNESIUM STEARATE, CAPRYLYL GLYCOL, LAUROYL LYSINE, SYNTHETIC FLUORPHLOGOPITE, TALC, PHENOXYETHANOL, CAPRYLIC/CAPRIC TRIGLYCERIDE, DIMETHICONOL, ETHYLHEXYLGLYCERIN, HEXYLENE GLYCOL, BISMUTH OXYCHLORIDE (CI 77163), CARMINE (CI 75470), IRON OXIDES (CI 77491, CI 77499), MICA (CI 77019), TITANIUM DIOXIDE (CI 77891). MADEMOISELLE: DIMETHICONE, BORON NITRIDE, LAUROYL LYSINE, MAGNESIUM STEARATE, DIMETHICONOL, PHENOXYETHANOL, TALC, CAPRYLYL GLYCOL, ETHYLHEXYLGLYCERIN, HEXYLENE GLYCOL, TIN OXIDE, BISMUTH OXYCHLORIDE (CI 77163), CARMINE (CI 75470), IRON OXIDES (CI 77491), MICA (CI 77019), TITANIUM DIOXIDE (CI 77891). GAL: SYNTHETIC FLUORPHLOGOPITE, BORON NITRIDE, DIMETHICONE, SILICA, LAUROYL LYSINE, MAGNESIUM STEARATE, DIMETHICONOL, PHENOXYETHANOL, TALC, CAPRYLYL GLYCOL, ETHYLHEXYLGLYCERIN, HEXYLENE GLYCOL, BISMUTH OXYCHLORIDE (CI 77163), IRON OXIDES (CI 77491), MICA (CI 77019), TITANIUM DIOXIDE (CI 77891). EMPRESS: DIMETHICONE, BORON NITRIDE, SYNTHETIC FLUORPHLOGOPITE, LAUROYL LYSINE, MAGNESIUM STEARATE, DIMETHICONOL, PHENOXYETHANOL, TALC, CAPRYLYL GLYCOL, ETHYLHEXYLGLYCERIN, HEXYLENE GLYCOL, TIN OXIDE, BISMUTH OXYCHLORIDE (CI 77163), CARMINE (CI 75470), IRON OXIDES (CI 77491, CI 77499), MICA (CI 77019), TITANIUM DIOXIDE (CI 77891). FILLY: BORON NITRIDE, DIMETHICONE, MAGNESIUM STEARATE, CAPRYLIC/CAPRIC TRIGLYCERIDE, LAUROYL LYSINE, TALC, PHENOXYETHANOL, CAPRYLYL GLYCOL, DIMETHICONOL, ETHYLHEXYLGLYCERIN, HEXYLENE GLYCOL, BISMUTH OXYCHLORIDE (CI 77163), IRON OXIDES (CI 77491), MICA (CI 77019), RED 40 LAKE (CI 16035), YELLOW 5 LAKE (CI 19140). DEAR: TALC, SYNTHETIC FLUORPHLOGOPITE, BORON NITRIDE, LAUROYL LYSINE, MAGNESIUM STEARATE, ZINC STEARATE, DIMETHICONE, CAPRYLIC/CAPRIC TRIGLYCERIDE, SILICA, PHENOXYETHANOL, CAPRYLYL GLYCOL, DIMETHICONOL, ETHYLHEXYLGLYCERIN, HEXYLENE GLYCOL, BLUE 1 LAKE (CI 42090), IRON OXIDES (CI 77491), MICA (CI 77019), RED 40 LAKE (CI 16035), TITANIUM DIOXIDE (CI 77891). MISSY: TALC, BORON NITRIDE, ZINC STEARATE, LAUROYL LYSINE, SYNTHETIC FLUORPHLOGOPITE, MAGNESIUM STEARATE, DIMETHICONE, CAPRYLIC/CAPRIC TRIGLYCERIDE,SILICA, PHENOXYETHANOL, CAPRYLYL GLYCOL, DIMETHICONOL, ETHYLHEXYLGLYCERIN, HEXYLENE GLYCOL, CARMINE (CI 75470), IRON OXIDES (CI 77499), MANGANESE VIOLET (CI 77742), MICA (CI 77019), RED 40 LAKE (CI 16035), TITANIUM DIOXIDE (CI 77891). DAMSEL: SYNTHETIC FLUORPHLOGOPITE, TALC, BORON NITRIDE, ZINC STEARATE, LAUROYL LYSINE, MAGNESIUM STEARATE, DIMETHICONE, CAPRYLIC/CAPRIC TRIGLYCERIDE, SILICA, PHENOXYETHANOL, DIMETHICONOL, CAPRYLYL GLYCOL, ETHYLHEXYLGLYCERIN, HEXYLENE GLYCOL, CARMINE (CI 75470), BLUE 1 LAKE (CI 42090), IRON OXIDES (CI 77491, CI 77499), MICA (CI 77019), TITANIUM DIOXIDE (CI 77891). DUCHESS: SYNTHETIC FLUORPHLOGOPITE, TALC, BORON NITRIDE, ZINC STEARATE, LAUROYL LYSINE, MAGNESIUM STEARATE, DIMETHICONE, CAPRYLIC/CAPRIC TRIGLYCERIDE, SILICA, PHENOXYETHANOL, CAPRYLYL GLYCOL, DIMETHICONOL, ETHYLHEXYLGLYCERIN, HEXYLENE GLYCOL, IRON OXIDES (CI 77491), MICA (CI 77019), TITANIUM DIOXIDE (CI 77891). The shade names are given on the flip side of the outer box. 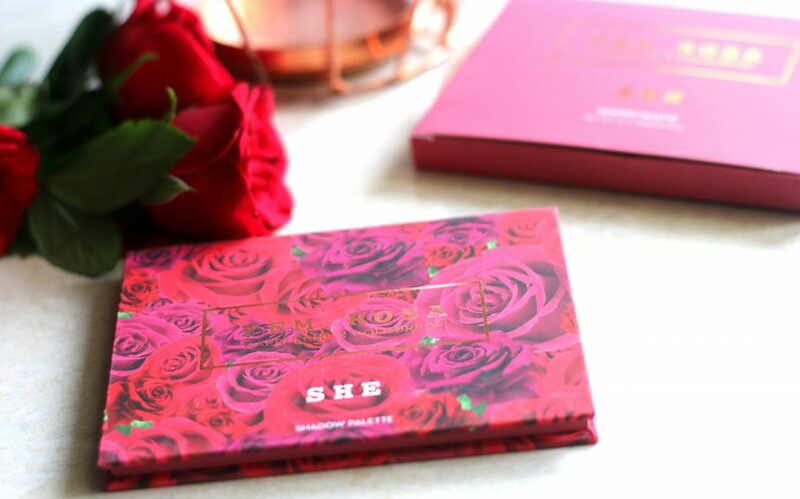 How pretty is the palette itself – That rose theme cardboard palette front is absolutely gorgeous! Such an instagram worthy palette in itself. The cardboard box comes with no mirror and no applicator and it also don’t have any shade names printed on the box. I wouldn’t describe it as a warm palette. 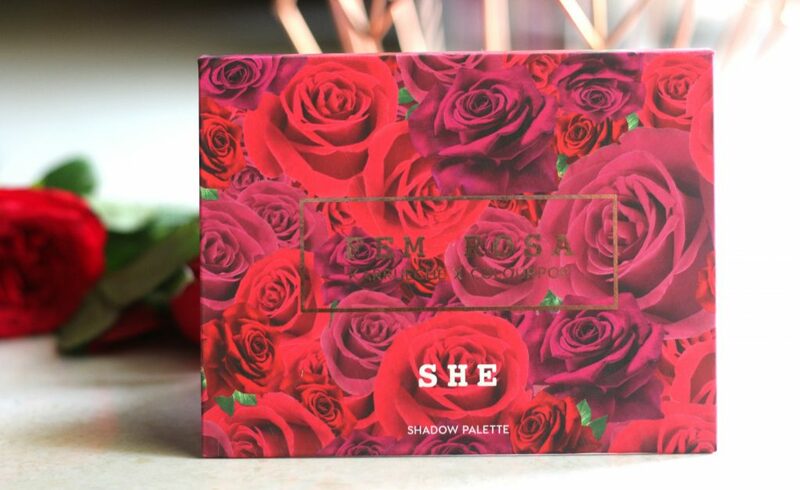 This palette contains 12 shadows which are a mix of matte, satin, and metallic finishes as you can see from the pictures. There are 4 mattes, 1 satin, and 7 metallic shadows. The palette is described as a mauve toned palette. I would say it as a cool toned palette. Ladylike: This is a metallic finish champagne shade. Great as a inner corner highlight or along with darker shades for a feathered effect. Babe: A satin finish light peachy pink shade. Chick: A metallic finish subtle gold shade. Mademoiselle: metallic rose gold shade that is universally flattering. I love this to be used as an overall lid color too. Gal: metallic red with copper duochrome effect. A very vibrant color that is perfect with Indian outfits.Very pretty shade to create a neutral effect and it goes well with a lot of darker browns, blues and purples. Empress: a metallic mid-tone pink plum shade. One of my favorite shade from this palette. Filly: metallic rusty orange shade with shimmers to it. 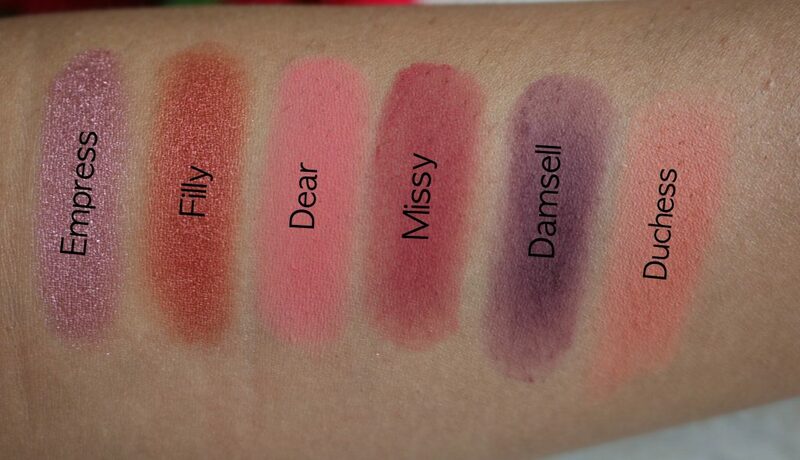 Dear: matte warm rose. Perfect for spring looks or to be used along with silvers etc. This is a very pretty color. Missy: matte deep burgundy. My favorite. It can be used for a variety of looks for both day and night. Damsel: matte smokey violet. Fall look is incomplete without this shade. Duchess: matte dusty coral shade. Again a spring-y kind of a shade. But, This along with the metallics are awesome! All of the eyeshadows are nicely pigmented. All of them are very buttery soft in texture. Metallic finishes are my favorites and they apply beautifully as well. 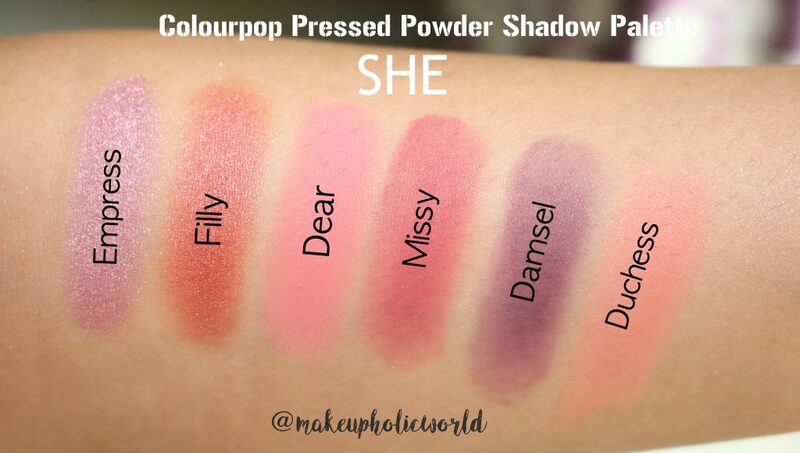 Some of the paler matte shades don’t have a high colour payoff though. Richer shades kind of balanced it all out. When swatching using my fingers, I felt the ‘matte’ colors were little difficult to blend. It felt powdery. Check the picture below. This was taken when I tried to swatch matte colors using my fingers. Using brush, they were easy to pick and it picked the colors easily and it was easy to blend and work with as well. Also, good factor that these appear awesome during both wet and dry application. Matte shades as I said – even though on touch appeared buttery; it did give fallouts. Nothing major. The shades didn’t fade and stayed pretty long. I worn them for about 6-7 hours without any problem and I think it’s really a great quality for a $16 palette. 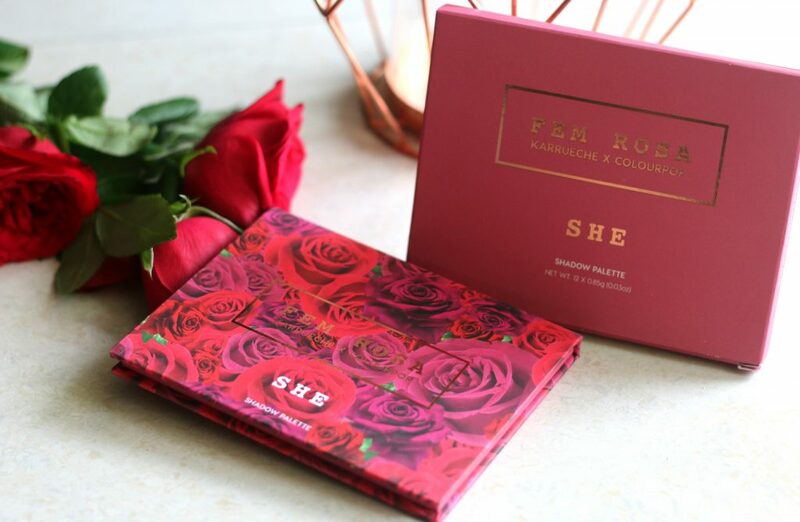 The Colour Pop She Palette retails for USD $16.00 for .85 oz of product which means roughly .03 oz per eyeshadow; 12 eyeshadows in total that equals USD $1.33 per eyeshadow. A pretty fair value for the price we pay. 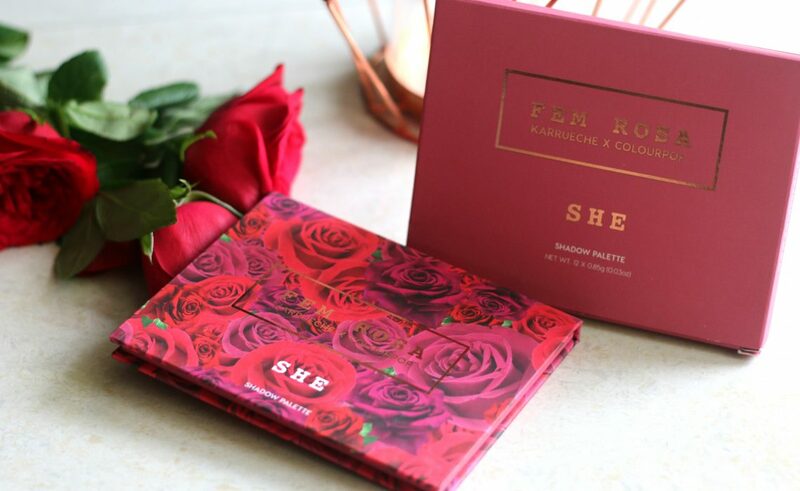 Considering it’s luxe packaging and the quality – I think it’s awesome! However, I strongly feel – The shades names would have been printed on the cardboard box. 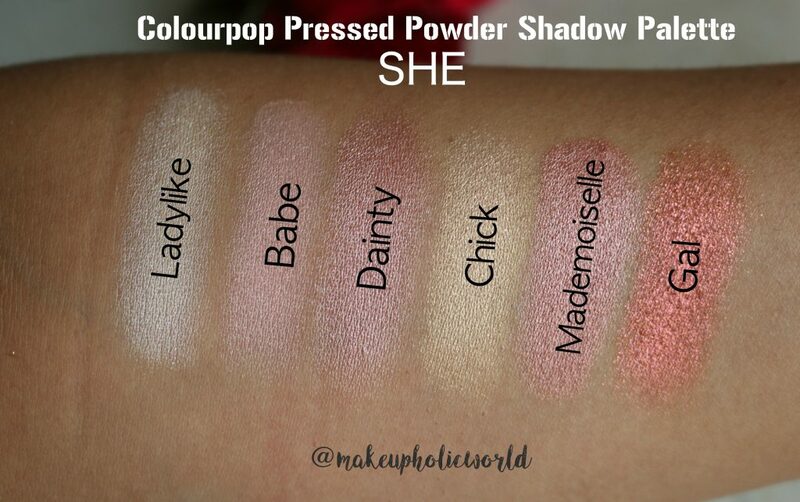 I love to see the shade names along. ‘Mirror’ – I am not considering this as I don’t think it’s of no use to me at least. and majority I know don’t mind it as well. 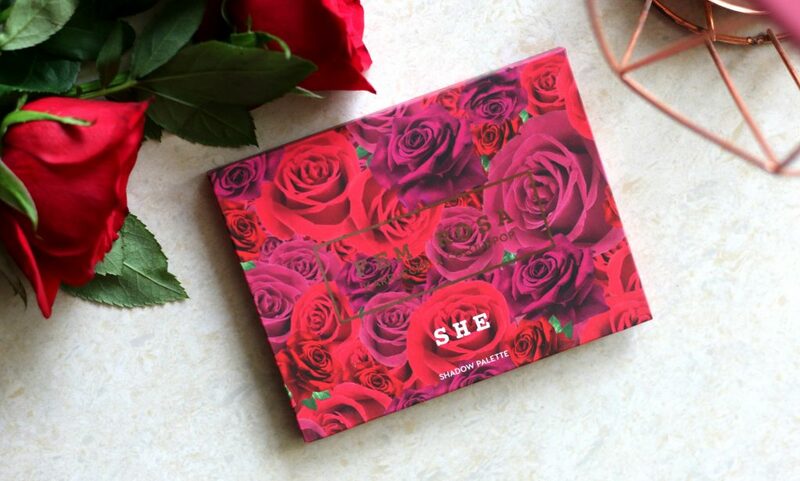 Packaging is quite sturdy and with it’s classic romantic rose packaging and the price point – It’s a great gift as well. 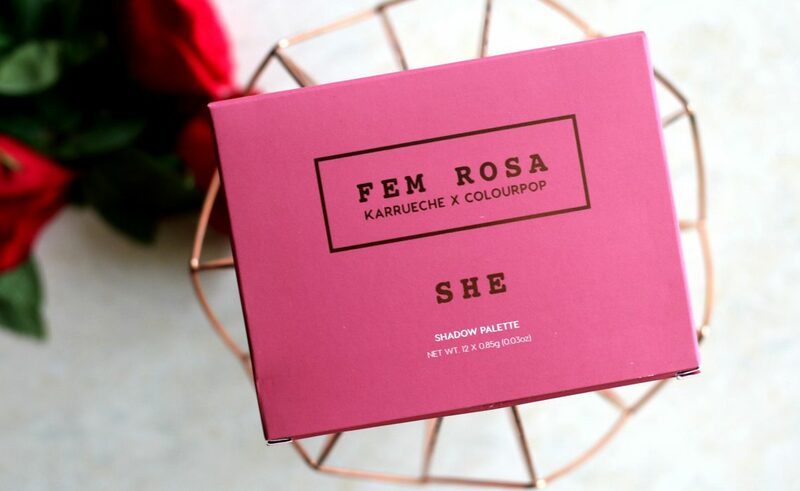 I feel like Colour Pop and Karrueche did a great job coming up with this unique palette. It’s always out of stock too. 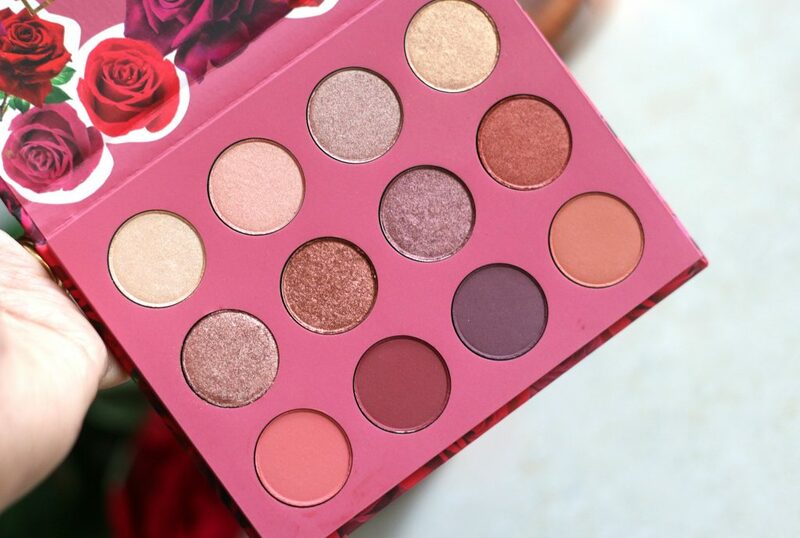 If you never got a chance to try it yet – Be sure tofollow colourpop’s Instagram handle. That’s where they announce most of their restock dates. 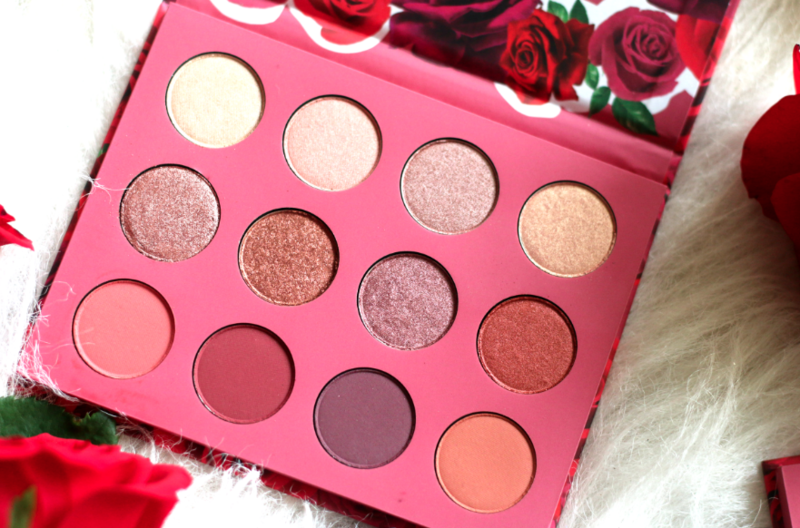 I love the fact that this palette has a mix of everything – mauve, pink, peach, plum, red and gold. These colors look great on every skintone especially deeper skintones. 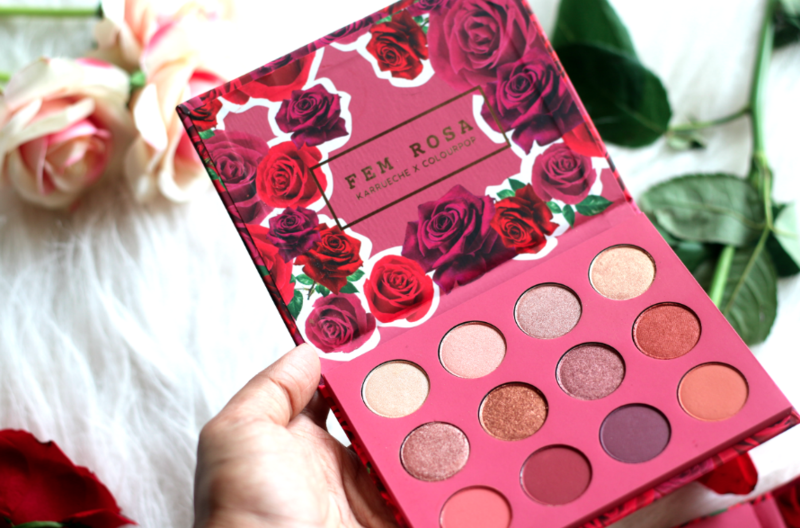 This palette is a great relief from the neutral palettes that every brand have been coming out with. If you’re a fan of pinks, plums and metallics – you’ll enjoy this palette than anyone else. 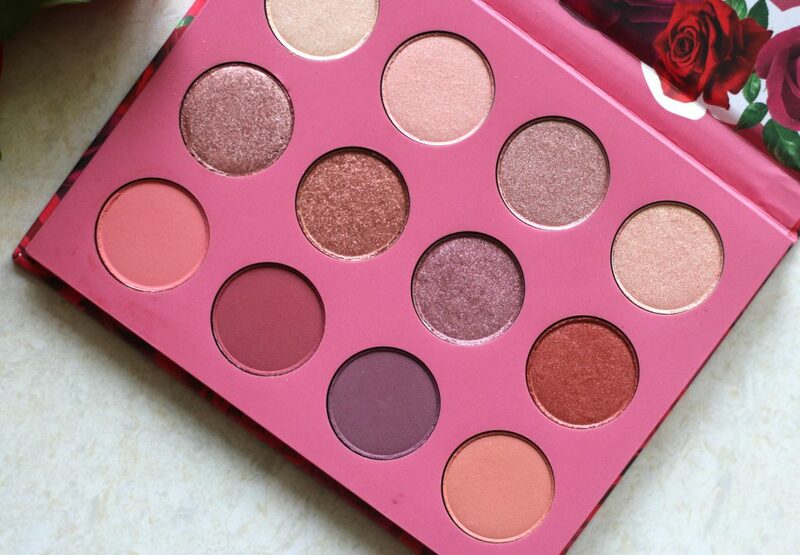 if you don;t like peach or pinks – I would say you should skip this palette. 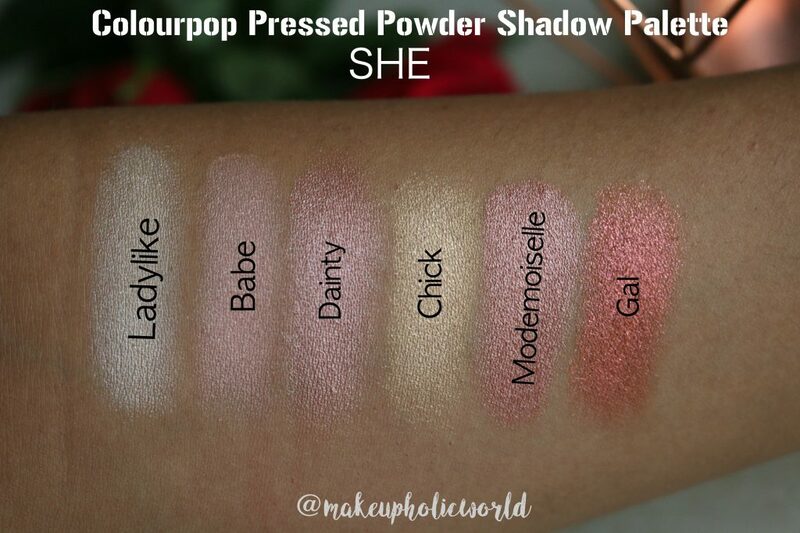 Have you tried ‘SHE’ Palette from Colourpop ? 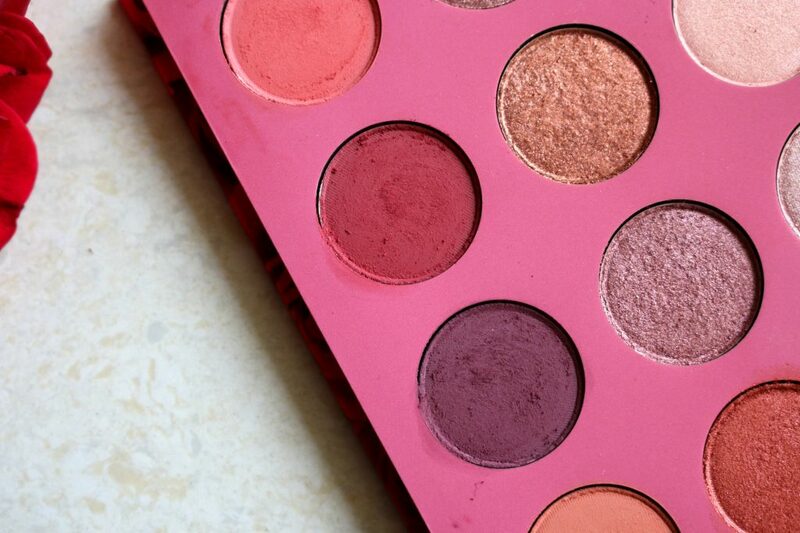 This palette has some really amazing shades – Perfect for Fall. Looks stunning on you! 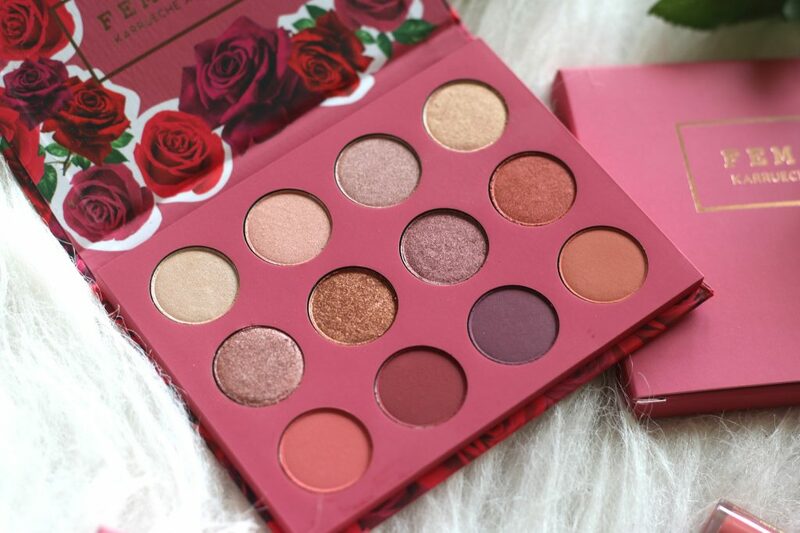 Thank You Ash <3 Colourpop palettes are my favorites! 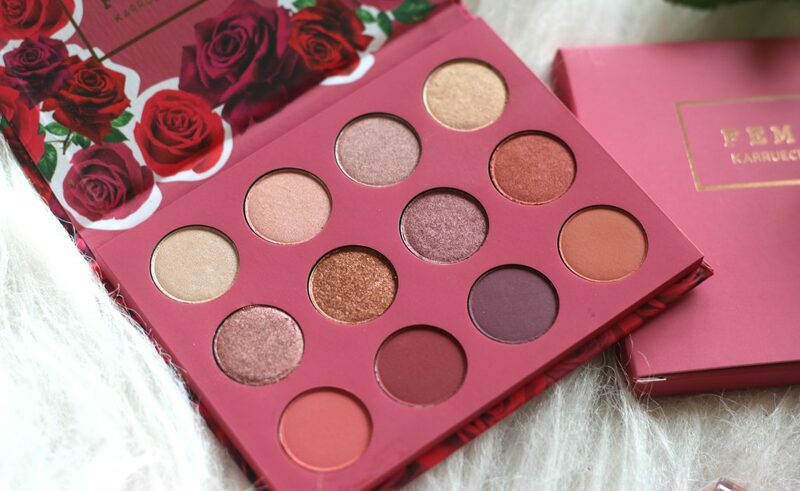 This palette is indeed so beautiful. 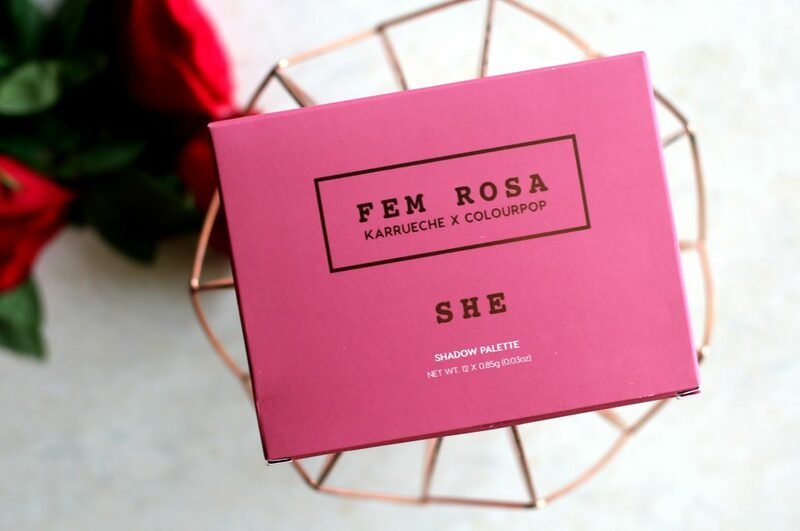 The packaging and all the shades are so gorgeous. Love your look, so glamorous. I am very tempted to buy this or Yes please! My my.. You looking absolutely breathing.. Stunning!! 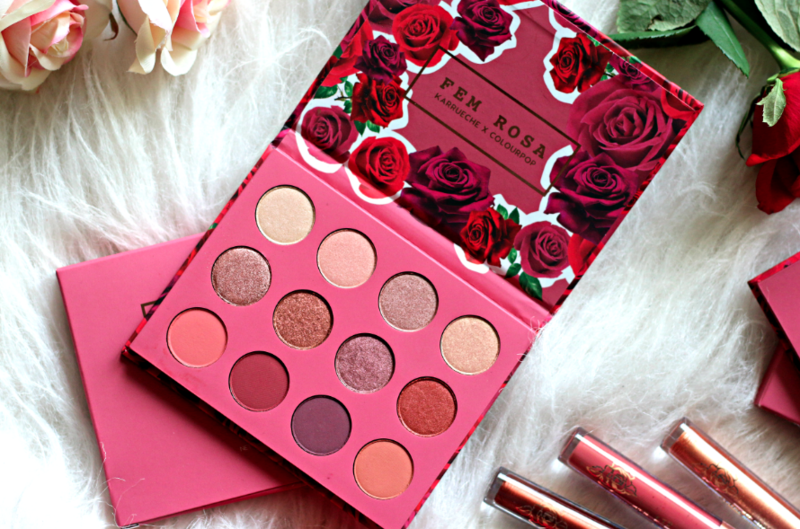 Fem Rosa is truly one of the most gorgeous looking eye shadow palettes.. I have it and love it to the core.. 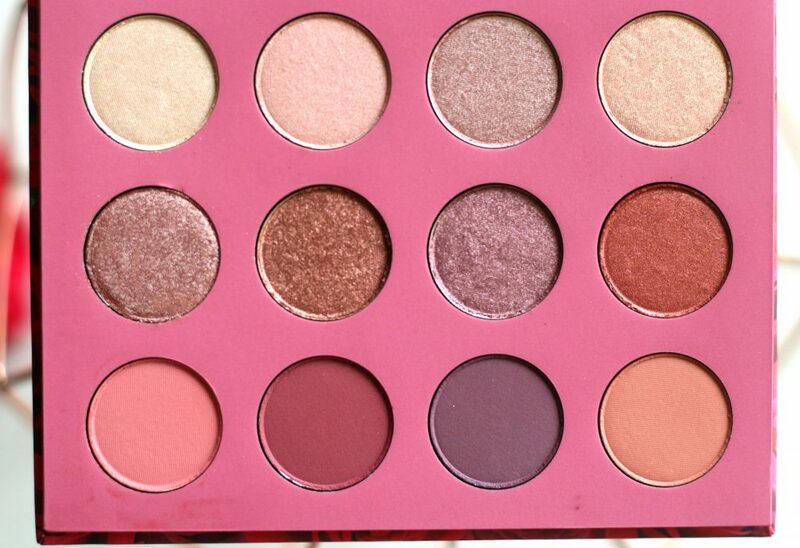 I love this palette too… Gal and Missy are my favorite shades! And true.. a relief from all the earthy neutral palettes around everywhere. I got mine, and I looooove it!